18 days and counting until our annual October trip to the Happiest Place on Earth. AKA Disneyland. I’ve started packing already. I have to conjure up some Halloween costumes too. Thinking we could all go as the Guardians of the Galaxy. Hmmm……maybe. Disneyland during the Halloween celebration is magical. I think maybe even more so than during Christmas. Pumpkins everywhere. 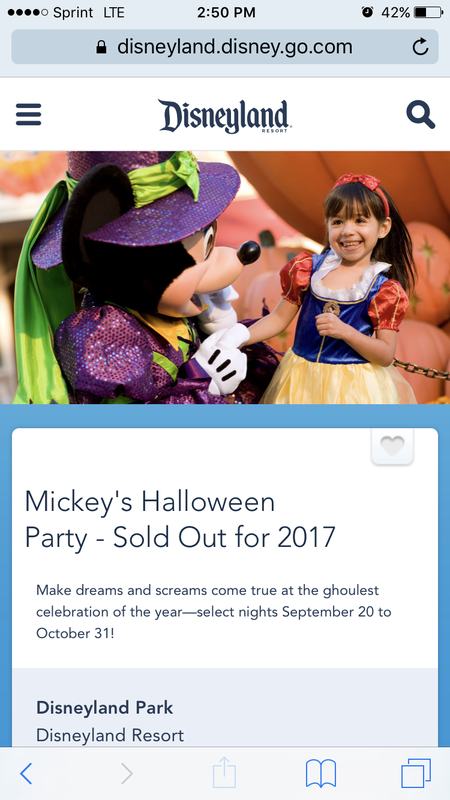 To make our experience even better we pay the extra fees to attend Mickeys Trick or Treat Party. The special event tickets always sell out. We buy ours in August, shortly after they become available for purchase. This special event ticket gives you the right to stay in the park after it closes for everyone without a ticket. They put a wristband on you when you check in and hand you a small bag for truck or treating. It is really tiny so if you attend be sure to bring a backpack. Trick or Treat paths are set up throughout the park and they never run out of treats. If you like a certain treat, just keep going back through that path. They don’t care. Occasionally the Treat is sliced apples or bag of carrots. Be sure you separate them from you other candy and snacks as soon as possible. Those fresh items make for a great pick me up snack while walking the park too. Another advantage is a special parade, fireworks and …… the villains are out and about for pictures and autographs. We buy a Disney Halloween shirt for the characters to sign with a laundry pen. The lines for the rides are short and sometimes nonexistent. We walked right on to Pirates of the Caribbean and Nightmare Before X-Mas themed Haunted Mansion. One time my youngest son and I ride the Storybook boat ride all by ourselves. That was a very special night. This year not only will Disneyland be decorated for Halloween but California Adventure will join into the Halloween spirit. Mater is dressed as a vampire. I’m so excited to see everything. I think that’s one of the great parts of Disney Magic. Finding new things each time you visit. I have an annual pass so I go several times a year always finding something new to me. I won’t give away all of the special sites and magic because it really is something you must to see to believe. Disney magic is real if you open up and let it in. I will report back with updates soon.